Bread usli is a simple and easy to prepare Konkani snack item, a quick fix menu especially on lazy days. You can prepare them using left over bread slices. When I decided to prepare it in traditional GSB way, I was confused. Have you heard of a marathi phrase "Vyakti titkya prakruti" which means as many as peoples that many different natures and perceptions. So when it comes to cooking a particular dish the same phrase gets extension with difference in their perceptions and practices about the use of ingredients or the method of doing it. Even for this bread usli preparation, you will come across many versions such as adding cumin seeds, chopped tomatoes, coriander leaves for garnish, etc. 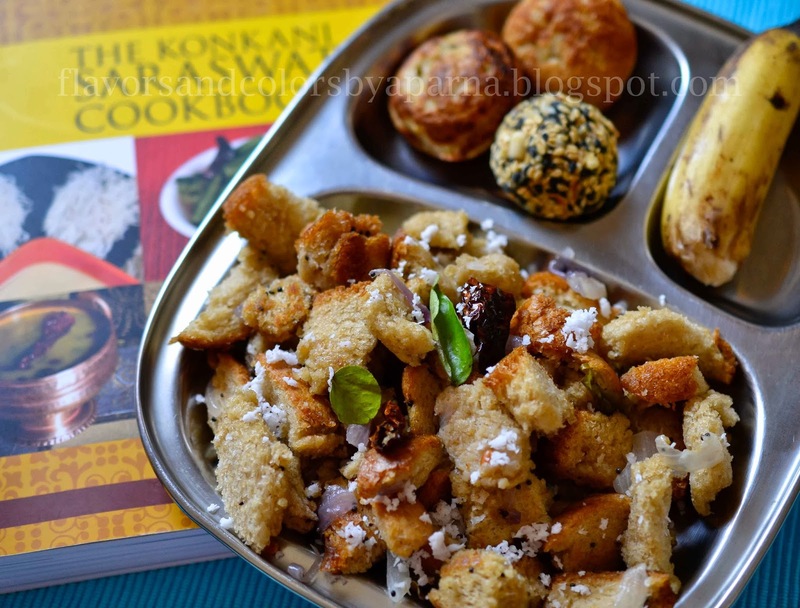 For me, with overlap of Maharashtrian cuisine over Konkani cooking I was not able to zero down the exact ingredients to prepare and call it as GSB snack, that many variations I have experimented on this dish,,,have even added chaat masala and grated cheese. Tried calling mom and check with her. The phone kept ringing, probably she was away from her phone busy in her work or gone outside without carrying it. And this is when I remembered Asha mayi's book "The Konkani Saraswat Cookbook". I remembered reading about it in the index page and yes there it was on page 9 of the book. I liked the way Asha mayi has accurately mentioned even the quantity of water to be used in this dish. I have followed her recipe with minimal variation, by using brown bread and coconut oil. It was a perfect breakfast menu for us served along with wheat flour appo, tila undo and banana. Dissolve salt and sugar in 4 tsp of water and keep aside. Cut bread slices into small chunks in a large bowl/plate. Heat oil in a deep pan. Add mustard seeds and as they splutter, add urad dal and stir fry them till they turn light brown. Add finely chopped onions, curry leaves and saute them till the onions turn translucent, lightly caramelized. Pour in the salt sugar solution. Next add bread chunks and mix well until the chunks gets mixed with the seasoning. Cook on a low flame till most of the water gets evaporated. As the bread starts getting a light brown color [or as they start getting roasted] switch off the flame and garnish with grated coconut before serving. Enjoy it warm with tea or coffee. You can add chopped green chillies instead of red chillies. If you don't like onions, you can skip it. Try adding a pinch of hing/asafoetida instead. Lovely usili made with brown bread.